Had lovely views of a drake Garganey at Newburgh Priory Lake this morning. It was feeding by up- ending constantly. Seen first by Keith Gittens yesterday evening this bird is probably newly arrived and stopping to feed for a while before moving to its breeding area. The Garganey is the only breeding species of duck in the UK that spends the winter in tropical Africa. 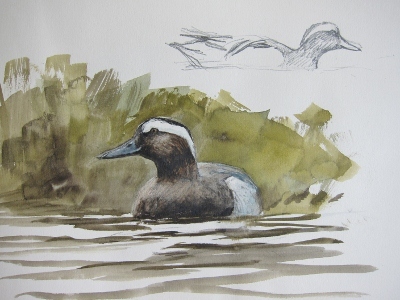 The drake is very beautiful when seen well, bold white stripe above the eye set off by rich brown with vermiculated grey flanks and elaborate wing covert feathers. The last one I saw at Newburgh was on 2nd April 2010. This one stayed for at least three days. 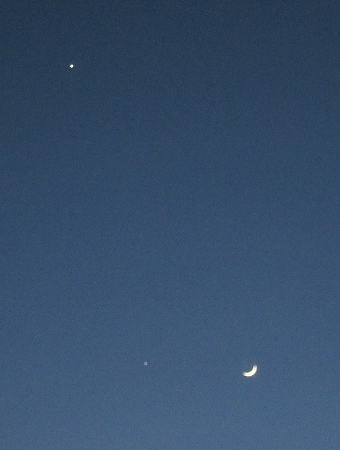 Two more evenings of beautiful configurations of the moon Venus and Jupiter. Whilst enjoying the sight I listened to migrating Teal and a flock of Whooper Swans. Also a sudden burst of full song in darkness from a Dunnock in our garden hedge. 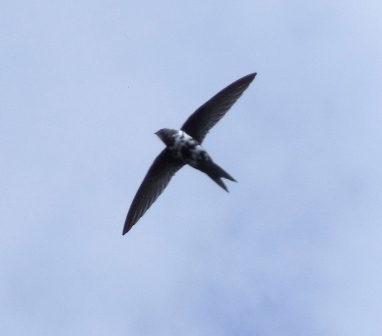 The Swifts are back in the walls of Jerusalem where they have bred for hundreds of years. Swifts nesting further south arrive much earlier than those in the north. This short clip shows the annual welcoming ceremony which brings many people together to share the Swifts of Jerusalem. Click here. Here in North Yorkshire we won’t be expecting the first Swifts until the last few days of April. 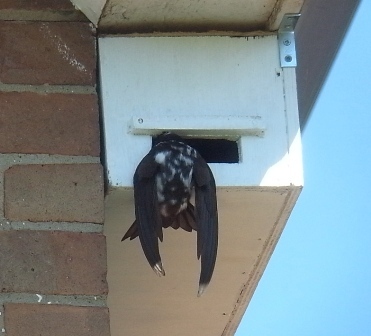 I am already preparing, installing a camera into the nest box where this partial albino bird nested last year. I hope to be able to show the nesting progress of this bird as the season unfolds. I am going to sketch grouse again this morning. 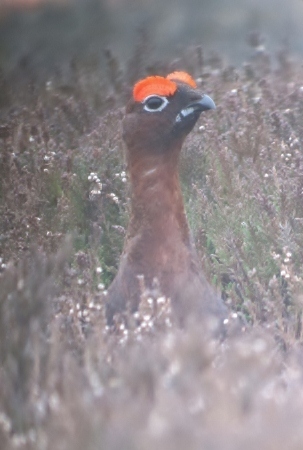 The males are extremely showy on the moors. I even had one following the car as I drove slowly along a moorland road- window down impersonating a male Red Grouse, it takes all sorts! Their calls “go back, go back” along with the sound of Curlew, Lapwing, Golden Plovers, Meadow Pipits and Skylarks make up the glorious chorus of northern moors in March. Two interesting moths by the light this morning. A gorgeous brown patterned Oak Beauty moth and a beautiful and strange plume moth. 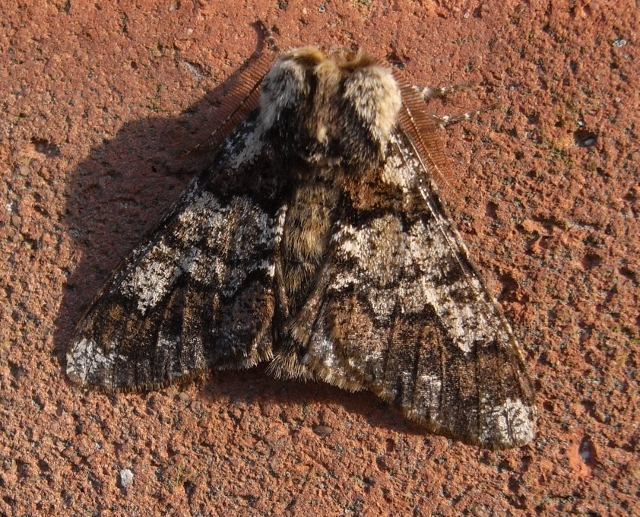 The Oak Beauty is an early moth, flying from late February to April. This one with feathered antennae is a male. The larvae feed on many types of tree including oak, hazel and alder. 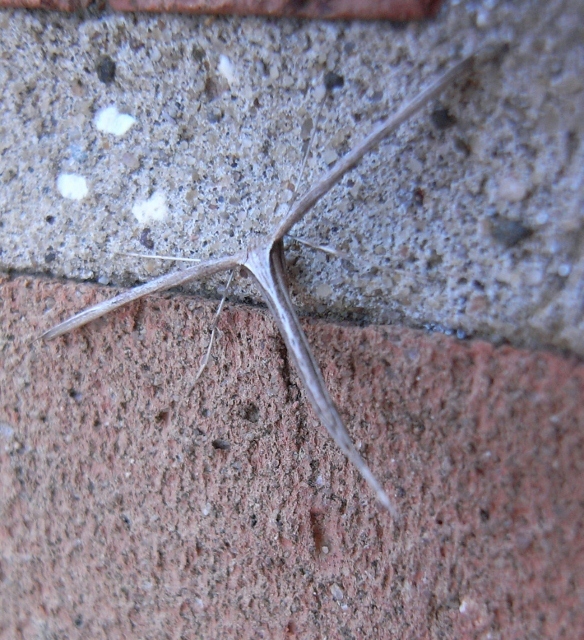 The plume moth is species Emmelina monodactyla, whose larvae feed on bindweeds. This very delicate moth has survived the winter in hibernation. On Friday night I was outside at 9.30pm listening to at least four male Tawny Owls when I heard Whooper Swans in the distance. They were on course to come right over us and the magical trumpeting sound of their calls amplified as they did so. The previous night I had heard Pink- footed Geese also migrating north on the way back to their breeding grounds. 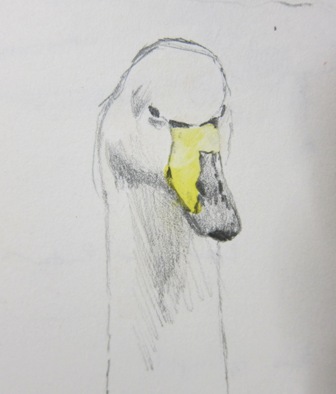 The Whoopers had probably come from Norfolk on their journey back to Iceland.